AUSTIN Nearly three years since Cody Stephens died of sudden cardiac arrest the Texas House approved HB 767. Cody wore number 76 for the Cougars, but did not have a heart screen done prior to practicing to play for Tarleton State University. Chairmen Wayne Smith, Dan Huberty, and Sylvester Turner, enabled passage of HB767 on the third reading last Tuesday, the vote went 60 to 40.x The day before it had tentatively passed 86 to 57. It was a bi-partisan effort to pass as some Republicans in the House are against any new regulations. This is not about somebody making a decision for the school board. said Scott Stephens, explaining that the bill is really moving the tests performed on potential athletes into the 21st Century. Fortunately, sudden cardiac arrest is rare, of those screened by the Cody Stephens Memorial Go Big or Go Home Foundation only 15 were found to have conditions that required further testing and two were told outright not to play school sports. The senate version was written by Chuy Hinojosa D- District 20. CROSBY, Texas  The Crosby community is mourning the death of a teenager killed on his way to school on Highway 90. According to the Harris County Sheriffs Office, the thirteen-year-old boy, a student at Crosby Middle School, was struck and killed by a motorist while crossing Highway 90 on his bicycle last Friday morning, April 10. The accident happened around 6:00 a.m. near the highway intersection with Bohemian Hall Road. Deputies said the boy was hit by several cars. The driver who first hit the boy did not stop, then another driver hit the bicycle and stopped to call police, deputies said. The first driver, returned later to the scene to talk to investigators, deputies said. He was detained but is unknown if any charges will be filed. The boy was transported by helicopter to Memorial Herman Hospital where he was pronouced dead. The boys name has not been released; according to the boys friends, he regularly biked to school. Counselors at Crosby Middle School helped students deal with the tragedy and condolences have been offered on the schools district Facebook page. In a community like Crosby, where almost everybody knows everybody and ties are close, something like this resonates very quickly with a lot of people in Crosby, said Dr. Keith Moore, Crosby ISD Superintendent. The area where the accident occured on Highway 90 is a busy road, with no street lights, reports said. HIGHLANDS  About 60 interested residents of the Highlands and Channelview are attended a briefing last Wednesday evening, held at the San Jacinto Community Center in Highlands. Garland worked from existing data, on how the federal EPA had dealt with other toxic Superfund sites similar to the San Jacinto Waste Pits. Youngs hypothesis is that if the cases are similar, and EPA has required removal of toxic materials, then they should call for a similar solution in the San Jacinto River, therefore treating this in a similar method as others. 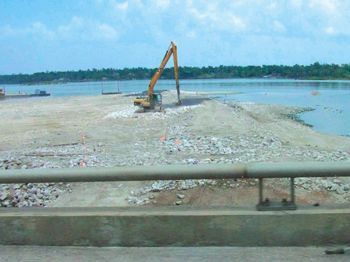 This approaching deadline has caused Young to increase her public push for citizens to be involved and concerned, as evidenced by articles recently published in the Texas Monthly magazine and the Houston Chronicle telling of her campaign to fully remove the toxic materials from the river. She said that in addition to the EPA determination of remedial action, there are also two lawsuits pending against the Responsible Parties to recover monetary damages for health injuries and property devaluation. One suit, led by attorneys Smith & Hassler, has engaged over 170 per sons who they plan to represent in court. Young said that one of the key issues is whether the DSHS, or Texas Department of Health Services, would conduct a health study of sickness in the area. DSHS said they are preparing a Cancer Cluster study from existing statistics, but do not plan an on-site survey of health. Young said this is not satisfactory, because it is not specific enough, nor focused on a small enough geographic area. The data covers everything from Baytown to Humble. Garlands conclusion is that this solution must be followed, to be consistent with the EPAs own National Contingency Plan, i.e. full removal of the highest concentrations, and cap over lower dangers. One woman said that her medical bills were $3000/month and she felt that her health was affected by the waste pits. Another said her son had attended San Jacinto Christian Academy in Lynchburg, which drew well water near the river, and that he had developed non-hodgkins lymphomia while he attended. Later, this ceased when he was not at the school.